Currently the largest public university in the US by enrolment, Arizona State University (ASU) has consistently ranked high both nationally and internationally for student satisfaction, employability, high quality education and affordability . Spanning across 4 sections, read on to find out A to Z about ASU! From admission requirements, university deadlines, application procedures and life as an ASU student! Ranked number 43 by USNEWS in the top 100 universities in the US, Arizona State University is a popular choice among international students, especially among the Indian community. Due to its high acceptance rate, ASU makes the cut in almost every student’s shortlisted universities. GREedge Admission Tip: Though the required minimum GPA for admissions is s 3 out of 4, ASU is an academic-centric university. This means that your GPA has a comparatively higher weightage than your GRE score in your overall application. So, students who have relatively higher academic records but lower GRE scores tend to apply with reasonable positive expectations of securing an admit. 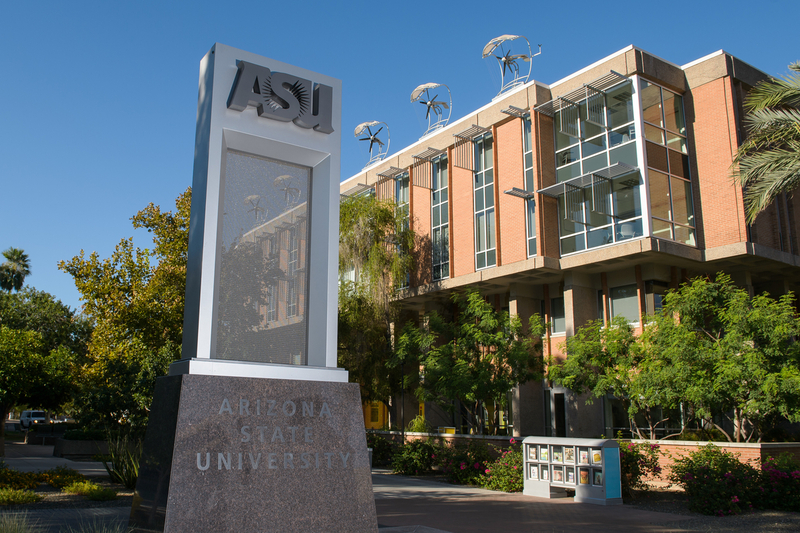 In addition to its large class sizes, ASU also offers a wide variety of top-ranked programs. However, due to the immense number of applicants for a particular course, the competition is quite high. 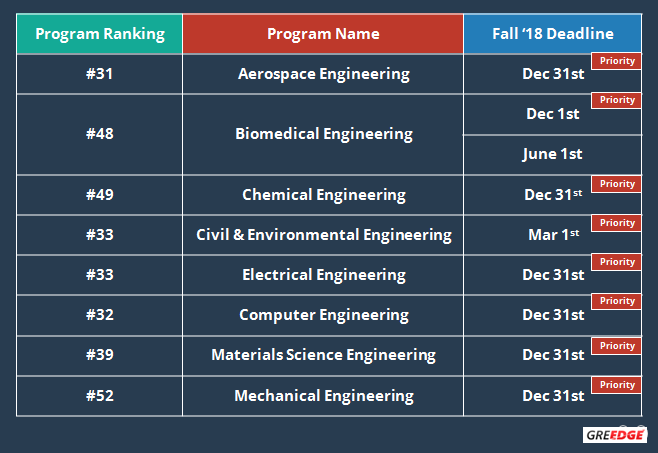 Let’s take a look at some of the program rankings & their deadlines. Rolling deadlines is a system of accepting applications at universities wherein the university does not stipulate a final deadline date for the submission/consideration of applications for admissions. Rather, there is an opening date after which applications are given out to students. The admissions are allotted on a first-come, first-served basis, provided they match the minimum criteria set. The admissions go on until the class sizes become full. This is usually an advantage for many international applicants as it gives them the benefit of admission without the pressure of a final date. However, in order to get ahead of the competition, it is best to apply early, especially if you are looking for financial aid! For example, for the Fall ‘18 intake, our admission experts agree that you must not delay your submissions further than Dec 15th! 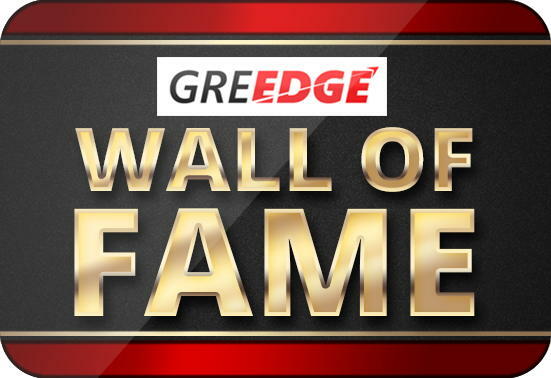 GREedge Admission Tip: If it’s not feasible to apply early, ensure you have a very unique SOP that makes you stand out from the crowd. Always remember, since the intake is high, the number of applications will be quite high as well. Making your SOP shine among the sea of applicants, while not impossible, is certainly not a child’s play. Read: Top 10 mistakes you should avoid while writing your SOP! Having a handy document checklist will ensure that you don’t miss out on anything important while sending your applications to any university. To that end, here is a list of documents that you need to submit along with your GRE & TOEFL/IELTS scores to complete your application. Online application: For most graduate programs, you are required to make your application online at the university’s official application portal. If you are applying for a graduate degree in law at the University’s Sandra Day O’Connor College of Law, you will need to apply at the law school’s website instead. Application fee: Generally, you are required to deposit a non-refundable application fee of $90 in order to successfully complete your application. Please keep in mind that it may vary depending on the program you want to apply to. If you submit your application after the lapse of the admissions deadlines, you will be charged an additional late fee of $50. Test scores: Along with your GRE or GMAT scores, you must submit a proof of English language proficiency, like an IELTS or TOEFL test score. These scores must be valid till the time you start your classes. While the university does not have a minimum requirement for the GRE or GMAT, you are required to have a minimum of 575 on the paper-based testing or 90 on the internet based testing on the TOEFL, or a minimum band score of 7.0 on the IELTS. Official transcripts: Your transcripts are a summary of the classes you took in college, and the marks and credits, if any, you earned in those classes. It will be obtained from the college or university where you pursued your undergraduate studies from. A minimum GPA of 3.00 on the US scale is required to apply for graduate studies at ASU. If your marks were not scored on the 4.0 scale, you can use ASU’s official conversion scale to see how your marks measure up. Remember, this scale is only to give you a rough idea, and while applying, you must input the scores as you obtained them (for example, 7.5 GPA or 82%). Letters of recommendation: Three Letters of Recommendation, written by a professor or a former employer, are required to complete your application. However, you are not required to submit the LORs yourself. During application, you will be asked to enter the email addresses of the three referees, so that they can be contacted directly by the University for the reference. Statement of purpose: A brief Statement of Purpose must be submitted along with your application. The SOP must be no longer than 500-750 words, and should detail your past academic performances, your goals and ambitions, and your reason for applying for graduate studies at ASU. CV or Resume: A copy of your CV is required for specific programmes, like the MS in Mechanical or Aerospace Engineering. Please note: All the documents, including CVs, transcripts and test score must be mailed to the University’s admissions office and not submitted online. Once you mail these documents, they become the property of ASU and will not be returned to you. Thus, make sure that you have sufficient copies of these documents before mailing them. [GREedge eBook]: Evaluate your profile like the admissions committee and find out if your profile is suitable for ASU here. Get Your Free Copy Today! Being the largest American university ensures that there is no dearth of societies, campus activities, sports, fraternities and sororities, and a vibrant campus life. ASU welcomes students from over 130 countries each year, which means that you will get to meet and study with people from across the globe. ASU takes the Residential college approach to housing, which means that during your time at the university, you will be surrounded by classmates and faculty members from your college. This promotes a warm, tightly knit environment, and fosters deep relationships between the teachers and the students. The residence halls have easy access to the dining rooms, healthcare services and the main campus buildings. The resident halls are a walking distance from the main university buildings, but if you choose to drive, you can purchase parking cards from the University office at nominal rates. The city of Tempe is large, student friendly city and is well-connected to other cities like Phoenix, Tucson and Prescott through buses, which make for the perfect getaway for a long weekend. Apart from Engrained, ASU’s famous cafe known for its quick meals and coffee, ASU also has a host of restaurants and eateries around the campus for your convenience. You can opt for residential meal plans, which will substantially reduce the costs of your meals at the University. The fare offered is rich, varied and designed to suit every palate- from tacos to soup and sandwiches. The menu changes daily, and is uploaded everyday on the website for your convenience. With 1000+ clubs and societies spanning a vast range of interests, there is something at ASU for everyone. ASU firmly believes that clubs and organizations are the easiest way to promote unity and university pride, and thus heartily welcomes all students, whether undergrad or postgrad, to join in and pursue their passions. The Arizona State Sun Devils are the athletic teams from ASU, with nine men’s and eleven women’s varsity teams, and a large fan base. 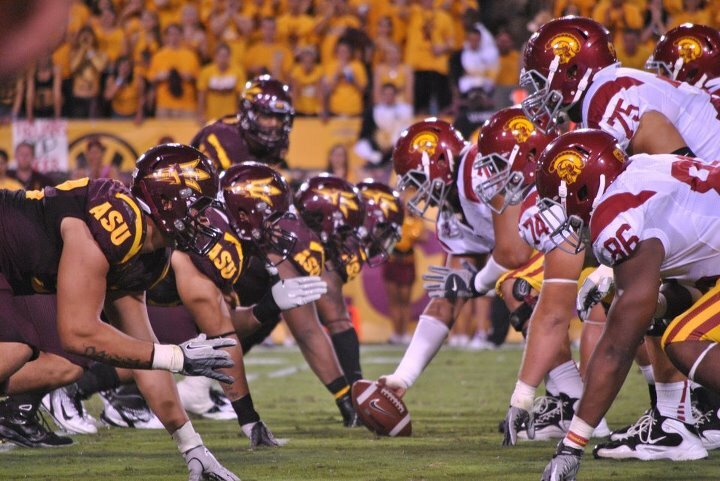 Other than these professional teams, ASU also offers recreational sports teams, including swimming, basketball, tennis and football, for both the aspiring athlete and the student who simply wants to relax. The ASU campus has access to top-notch medical facilities and ambulance services round the clock, as well as a pharmacy. The official campus bookstore and a well-stocked supermarket are available for the convenience of the students and faculty members. The campus welcomes students with physical disabilities, and offers several services to make things a little easier for those with disabilities. ASU takes the careers of its students extremely seriously, and the Careers Centre office regularly conducts jobs and internship fairs to make it easier for students to find new jobs. A number of research and teaching assistantships are also offered to deserving students. If you have time to spare, you can spend it volunteering at the many NGOs and shelters in and around the campus. With a proactive approach to academics and repute for innovation and development, ASU is the place to be if you want to get the best value for your money. Not only will you live and study in a diverse, multicultural atmosphere, but you will be taught by some of the most prominent names in academics. Check out our review of Carnegie Mellon University! Comment and let us know what your dream universities are and we’ll review them for you! MS IN US| ECE| GRE302(V-148,Q-154,AWA-3.0)| UG-67.70 | 1 INTERNATIONAL JOURNAL | EXTRA CURRICULAR AND SOCIAL ACTIVITIES ++ | ONE INTERNSHIP FOR THREE MONTHS | 12TH-83% | 10TH- 90% | FALL 2017| MAJORS- EMBEDDED/ANALOG CIRCUITS | TOEFL YET TO GIVE | univ applied – UTD, UNCC, SYRACRUSE STATE, SJSU..!! thought of applying for – ASU, IIT(CHICAGO),PSU ..please help me with the university selections thank you . Having a paper publication in an international journal will definitely prove to be beneficial during applications. But, most of the universities that you have selected for application are quite ambitious. Your chances in IIT and UNCC are better than the others. Some achievable to safe universities might be: University of Illinois, Chicago; University of Texas, Arlington and University of Houston, Clear Lake. If you want any further admission assistance, you can drop in your details here: http://bit.ly/sensible-selection-16 and we’ll schedule a call with you as soon as possible! So does rolling deadlines mean, I can apply for theses universities anytime during the year? No particular date for Fall`17? For most of the programs, the applications are taken in rounds. However, some departments do specify a priority deadline date. For example, for CS, the final deadline date is Dec 1st, whereas, for Biomedical Engineering, the applications are accepted until June 2017. Which program are you looking for? Hi, I’m doing my 7th semester of BTech in CSE at VIT University, my CGPA is 7 and my GRE is on 2nd Nov, but I’m expecting a good score as I have been getting 315 in mock tests, and I still have some more time left to prepare better. I have 2 CSE projects, and 2 good internships at IIM-B and Tech Mahindra, in Data Science, the program I am aiming to apply for at ASU. I have good extra curriculars too, and am currently writing a research paper. Do I have a chance? My CGPA might increase too by the time I apply for Fall 2018, as my 7th sem results will be out by then. Please help! Hi, My GRE score is 310(Q:- 161, V:- 149, AWA:- 4), TOEFL yet to take, UG CGPA: 9.33/10(Topper)| 1st University Topper for 3rd Semester, 1 International Publication, Seeking Universities for MS in computer science, Research area interested:- Artificial Intelligence | Computer Literacy:- C|C++|Java|Python|Ruby|R|ROR|Django|Machine-Learning|MATLAB|Graph-Database|SQl|Postgres. Can you please tell me ambitious, moderate and safe university options? Next story Can I give GRE for MBA? GRE Super Over – Learn & Remember GRE Words Easily!